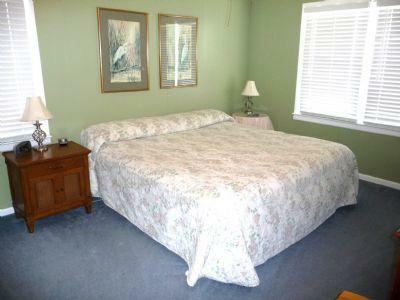 WILM 9 No Smoking/Must be 25 to reserve a home with Cooke Vacations/No pets. This vintage home is for the renter that loves a classic beach home. Located on a natural canal, it provides a peaceful atmosphere for enjoying the scenic marshlands. 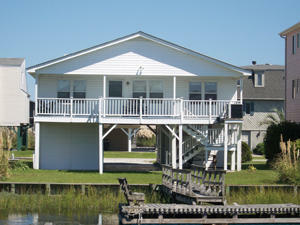 Unwind on the covered porch, take in the day on the sundeck or the beach - just a short walk away. The home is equipped with multiple color cable TVs, ceiling fans, an outdoor shower, washer & dryer, dishwasher, microwave and a floating dock. There is also a charcoal grill & crock pot available at the property. 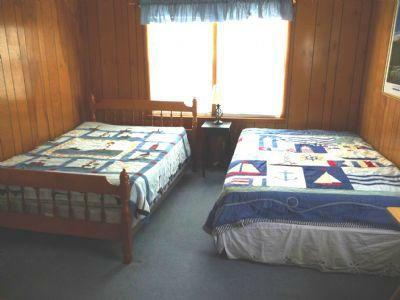 Ceiling fans in all bedrooms. Carpet throughout the living room & bedrooms. Approx 1100 heated sq. ft. porch/deck furniture includes: Table w/ 4 chairs, 2 Adirondack chairs, picnic table downstairs on the patio & swing under house. BEDS: 1King, 1Queen, 3Double. Tenant provides refills for gas grill. No smoking, no pets.